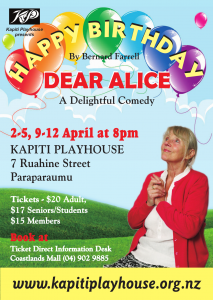 Happy Birthday Dear Alice - Kapiti Playhouse Inc.
A raging bull, a video camera, a coffee-making alarm clock, a faulty hearing aid and the savage politics of family life – some of the elements that combine hilariously to form the backdrop of Bernard Farrell’s play Happy Birthday Dear Alice. 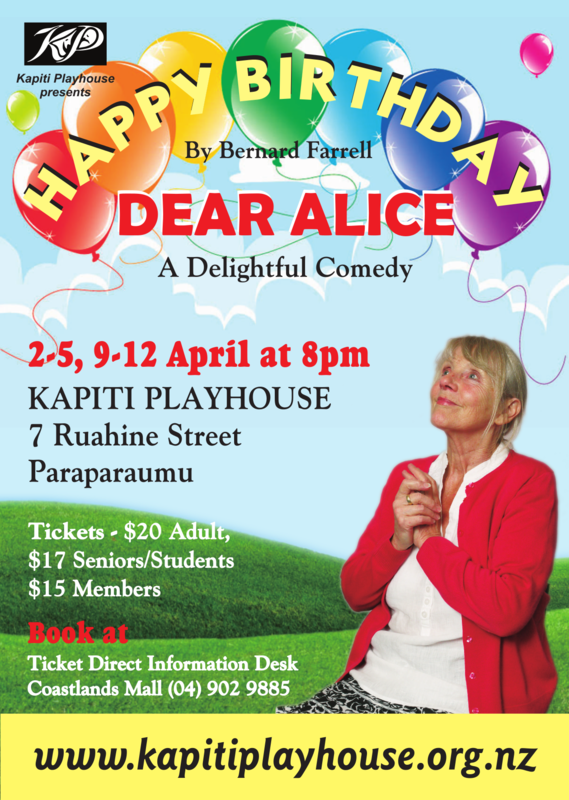 The story centres on Alice as she celebrates her 70th birthday. In flashbacks, she recalls former birthdays as her children try to convince her it’s time to enter a retirement residence. Alice has other ideas in which her dead husband’s partner Jimmy has a major role. 2-5, 9-12 April 2014 at 8pm. $20 Adult, $17 Seniors/Students, $15 Members. Tickets now available from Ticket Direct Information Desk in Coastlands Mall. Phone 04-902 9885. Also available online on the TicketDirect website. Please note that additional service fees apply to tickets purchased online. Kapiti Playhouse Theatre, 7 Ruahine Street, Paraparaumu. This is a two-act comedy set in the kitchen of Alice’s home. In Act One we celebrate Alice’s seventieth birthday and in Act Two we celebrate her seventy-first. See what changes, if any, a year can make! Due to a tragic accident, Alice was widowed at an early age and left to raise a son, Barry, and a daughter Barbara, on her own. Barbara now lives in San Francisco with her husband Cormac and Barry lives in England with his new girlfriend, Sandy, while Alice lives alone except for the company of Jimmy Heffernan, her neighbour for many years. Her children return each year to “celebrate” her birthday and present Alice with plans to place her in an “old peoples” home. However, this is Alice’s greatest nightmare and they have not counted on her determination not to go through with their scheme. Bernard Farrell has given us an excellent play with lots of laughs and one that all the Alice’s of this world can certainly relate to.